As you may have already experienced, hardest part of a big project is the first step. It’s easy to plan to start something, but when it actually comes to writing the first words, what do you do? As you stare at the blank page in front of you, how can you fill it? 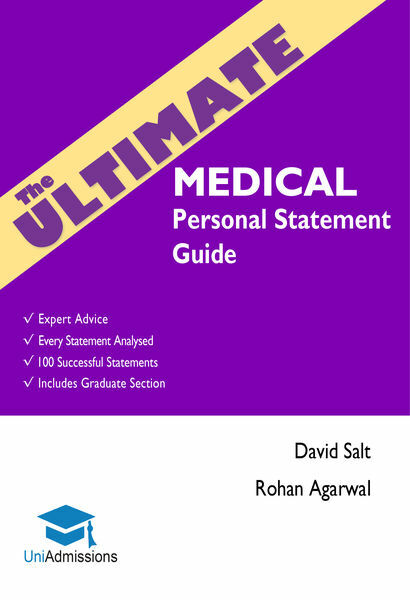 Published by the UKs Leading Medical Admissions Company, the Ultimate Medical Personal Statement Guide is the most comprehensive personal statement book available. It contains detailed expert advice for every stage of the writing process; from starting the opening sentence to making the finishing touches. It also includes 100 Successful Medical School Personal Statements so you can see what the admissions tutors at your university like (and don’t like!). With contributions and advice from over 25 Specialist Medical Tutors, this is a MUST-BUY for those looking to secure their place at medical school. Guide, Medical, Personal, Statement, Ultimate permalink.